As a kid, I never understood the point of coleslaw. Sugary, limp cabbage, mauled beyond recognition, like the day your pet tiger turns on you? Why waste a side dish slot on that when you could get–gasp–mashed potatoes and gravy? OK, so I still don’t totally understand choosing, let’s be honest, any side dish over mashed potatoes and gravy, but my understanding of coleslaw has blossomed, as I’ve discovered how balancing the dish can be when it’s done well. Crunchy and a bit sweet, creamy and a little tangy, it’s the perfect foil to a rich barbecue sauce or crispy fried chicken. But I still thought we could do better. I made appallingly simple BBQ shredded chicken sandwiches in the Crockpot for our gender reveal party, and O nearly had a breakdown when he realized he only got *one* the entire day. Never mind that I offered him three after a frenzied photoshoot before the guests arrived, he ate only one, then regretted it for the rest of his life (if by the rest of his life, you mean until I remade the recipe just for him). When I made the recipe again during the week–sharing soon!–I decided to up the ante and elevate the coleslaw. I’d settled for the flaccid deli option before, out of sheer necessity, but this time? This time, it’s on. 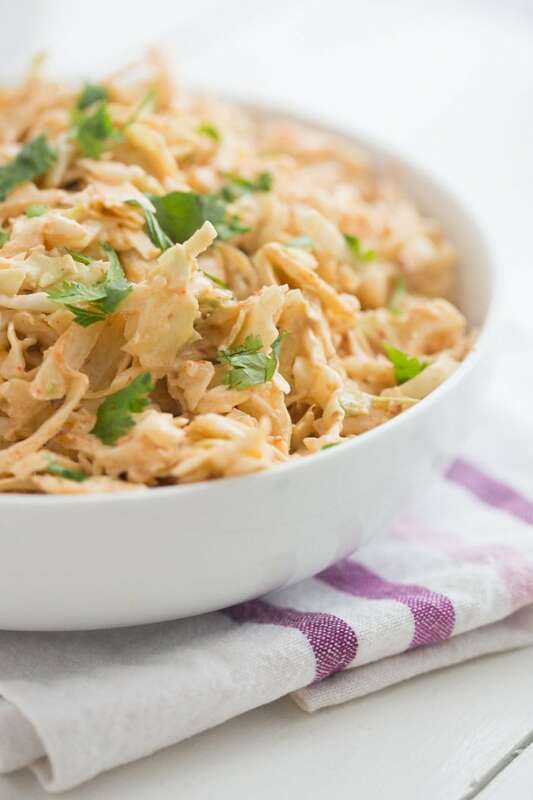 Inspired by my love for a crunchy, simplistic red cabbage slaw on fish tacos, I opted for an infusion of smoky chipotle peppers and adobo sauce–two of O’s and my favorite elements–with a touch of mild green onions. 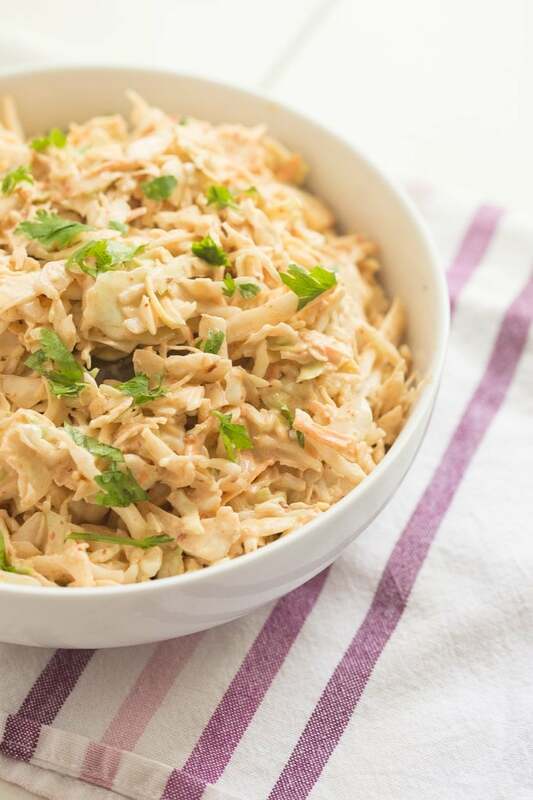 Layered on top of the sweet, smoky-in-a-whole-‘nother-way shredded BBQ chicken, I finally fell in love with coleslaw. He’s lucky I wasn’t having a particularly vengeful craving, else he’d be still wandering the streets with one sock half-on, stubble verging on full-blown beard, muttering to himself about how it all went wrong. Not that I’m like.. hormonal, or anything. But seriously, this is your new favorite coleslaw! 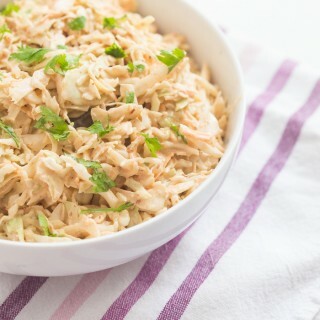 Perfect for barbecues and potlucks and summer in general, you’ll be so impressed at how much flavor is packed into 10 minutes of prep and how beautifully it pairs with BBQ sandwiches especially. Make this! Place coleslaw or mixed cabbage & carrots in a medium mixing bowl. In the bowl of a food processor, combine mayonnaise, garlic, chipotle peppers, adobo sauce, rice vinegar, and sugar. Process until completely smooth. Pour over coleslaw or mixed cabbage & carrots and toss to coat completely. Add salt to taste and then gently stir in chopped green onions. Cover and chill until ready to serve. Garnish with chopped cilantro, if desired. Goes perfectly with pulled BBQ sandwiches! This recipe looks great! Do you think I could make it Whole30 by just leaving out the sugar (and using whole30 approved mayo)? I feel like the sugar is probably important to balance out the flavors in this recipe. Thoughts? 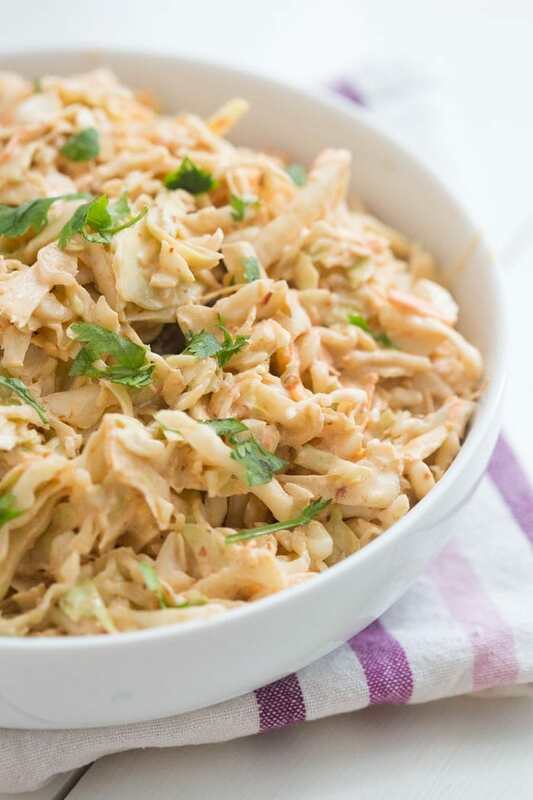 This coleslaw looks and sounds divine, Cheryl! Loving the spicy flavour! YAS. YAAAS. As a spice fanatic, my boyfriend will love me for this. Umm either I’m just totally the most forgetful person on the planet, or I seriously did not even know that you were expecting! Either way, YAY!!! Congrats girl! Soooo freakin’ happy for you and your hubby! And this coleslaw? Oh geez. I am a coleslaw girl through and through and this bowl is speaking wonderful things to me right now! Haha! I posted about it a couple times but haven’t been posting very regularly. I’m already huge now!! And dude this coleslaw was so good, even for coleslaw-haters like myself! But seriously, I have not stopped by for awhile — sorry 🙁 and you have so many good news. It IS so good! Like I said, I usually can’t stand coleslaw but damn, this was yummy. And I haven’t been posting! I went through such a weird time with my appetite so that’s why I wasn’t reading blogs or posting my own recipes 🙂 Thanks Pang!! We are so stoked! These are so good! Great for summertime cookouts. Great photos and keep it coming!